Messages 6 and 8, in the series above, were not recorded due to technical difficulties. Dr. Steven Dilday is a major modern-day Reformation scholar and has produce a wonderful series of messages in the "The History of the Service of Song" series featured above. He is also Pastor of Liberty and Grace Reformed Church in Northern Virginia, President of The Matthew Poole Project, Professor of Hebrew and Director of the Ph.D. Program in Puritan History and Literature at Whitefield Theological Seminary. He also directs the Master of Theology degree in "Ecclesiastical Latin" at Whitefield Theological Seminary. Dr. Dilday is currently translating the "Synopsis" written by the Puritan Divine, Matthew Poole. This project when completed will consist of approximately 82 volumes. Fantastic Sermon On Biblical Worship! This may be one of the best sermons you will ever hear about biblical worship. Don't miss it, if you truly desire to know the only kind of worship that pleases God -- all other forms of "worship," according to Scripture, being nothing but will-worship and idolatry (and, sadly, this is what most Churches practice in our day). ANTICHRIST, THE BEAST, HOLY DAYS, TRUE AND FALSE WORSHIP, COVENANTED REFORMATION, COVENANTING, THE COVENANTERS, etc. "There is no other book in which there is to be found more express and magnificent commendations, both of the unparalleled liberality of God towards his Church, and of all his works; there is no other book in which there is recorded so many deliverances, nor one in which the evidences and experiences of the fatherly providence and solicitude which God exercises towards us, are celebrated with such splendour of diction, and yet with the strictest adherence to truth; in short, there is no other book in which we are more perfectly taught the right manner of praising God, or in which we are more powerfully stirred up to the performance of this religious exercise." There are 547 Reformation resources (books, MP3s and videos) under the category "Reformed Worship, The Regulative Principle, Etc.," and 126 Reformation resources (books, MP3s and videos) under the category "Psalters, Psalm Singing and Music," on the Puritan Hard Drive. Moreover, if you use the Master Search Index on the Puritan Hard Drive to search for the word "Psalmody" you will obtain 1,843 search results in 171 books and articles! Also, you will see the results alphabetically by book title (with the author) and to the right of the book will be a plus sign. If you click this plus sign you we see each occurrence of the word "Psalmody" in one line of context. Furthermore, if you click on any of these lines, the book will be opened to the page with your search result -- and your search result will be highlighted! Never before has a research capability like this been available for such a large set of the best Puritan and Reformed books -- and, Lord willing, many more books (MP3s and videos) will be added to the Puritan Hard Drive in the future, as the Puritan Hard Drive has been designed for future expansion (which is only limited by the size of the hard drive). Are You Singing Heresies In Songs By Heretics? Find out in this sermon. A fascinating look at how Satan has used various heretics (like Isaac Watts, a Unitarian, Roman Catholics, etc.) to introduce man-made hymns into the church (to push God's Word out of public praise) and the destruction this has wrought. Discusses Reformed worship-song in the context of the regulative principle of worship [Sola Scriptura in worship]. Defends exclusive Psalmody from Scripture and the writings and testimony of the most prominent Reformers. "In his early years there, Calvin was not impressed with the quality of the singing at Geneva, so he took the practical step of requiring that the catechism classes for the children include the memorizing and singing of Psalms. Church office-bearers and Christian school teachers had a role here. Calvin states, 'Write a letter to the judges of the consistory to acquaint them with the fact that the Lord desires that the youth learn to sing the Psalms, and that the principal of the school and his headmaster teach the music of the said Psalms'" (John Calvin on the Wonder of the Psalms by Pastor Angus Stewart, Calvin quotation from, Ford Lewis Battles, The Piety of John Calvin [Grand Rapids: Baker, 1978], p. 142). "The translation that is now put into thy hands cometh nearest to the original of any that we have seen." - Thomas Manton, John Owen, William Jenkyn, Thomas Watson, Matthew Poole, and other Puritans in London at the time of the Westminster Assembly in a preface to the first edition of the Scottish Metrical Version. "It is truly an admirable translation from the Hebrew, and is frequently more correct than the prose version." in The Exclusive Claims of David's Psalms, by William Sommerville, p. 183. "Steadily expanding Psalters continued to be produced in Geneva: in 1562 [two years before Calvin's death and to his great delight] there appeared a metrical Psalter with all 150 Psalms. This Psalter was reprinted [an amazing] sixty-two times in its first two years and was translated into [an even more amazing] twenty-four languages (William L. Holladay, The Psalms through Three Thousand Years [Minneapolis: Fortress Press, 1993], p. 199). - Dr. Steven Dilday, Pastor of Liberty and Grace Reformed Church in Northern Virginia and http://www.sermonaudio.com/PRCNOVA, President of The Matthew Poole Project, Founder of Liberty and Grace Reformed Theological Seminary, also directs the Master of Theology degree in "Ecclesiastical Latin." Dr. Dilday is currently translating the "Synopsis" written by the Puritan Divine, Matthew Poole. This project when completed will consist of approximately 82 volumes. 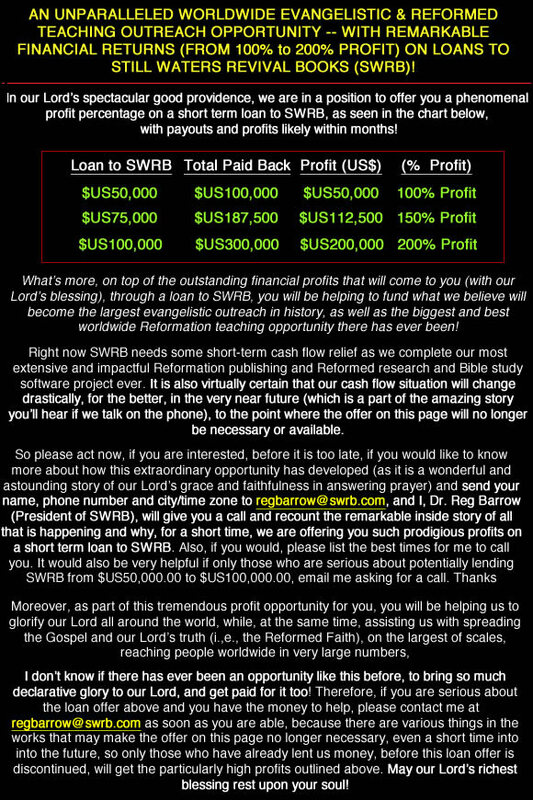 Also, we welcome you to join us and 86,306 others who follow our (SWRB) Facebook posts, at http://www.facebook.com/PuritanDownloads. You will find lot's of great free Puritan and Reformed resources, information and links here!